Every Little Helps? 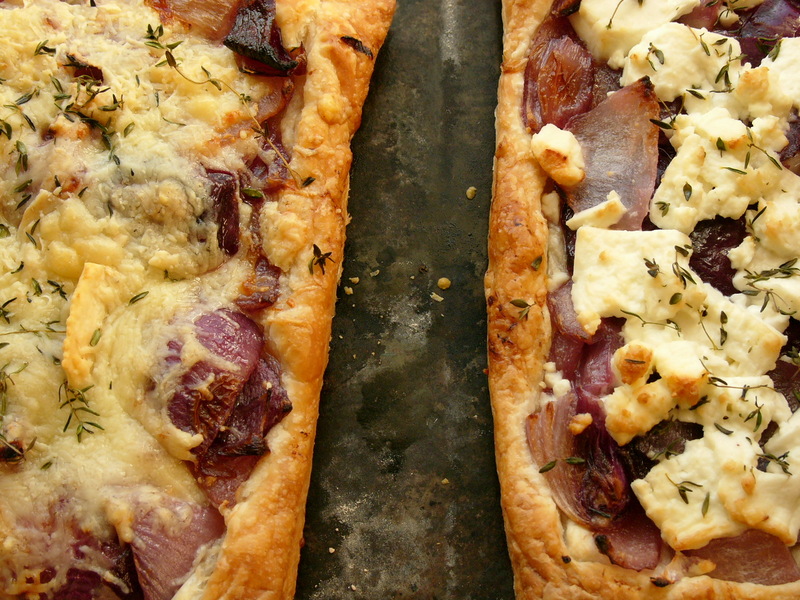 A Tesco-inspired Onion and Cheese Tart | WTF Do I Eat Tonight? I try and avoid shopping in chains like Tesco’s Express and Sainsbury’s Local mainly because, despite living in a relatively scrappy bit of north London, I am lucky enough to walk past a lot of nicer places on my way home from work. But, for a lot of people, especially city commuters, they are the only option and this week I decided to see wtf I could cook if I relied solely on one of these ubiquitous places. I started with Tesco’s. The one five minutes away from my front door is not very large but it has a much wider range than I expected, at least in some areas. For example, it has six relatively unusual cheeses: mozzarella, feta, halloumi, Parmesan, Roquefort and Welsh goat’s cheese. It sells gnocchi as well as the more obvious pasta and although its produce section is small, it does have some seasonal stuff (British asparagus, spinach, strawberries and plum tomatoes). I was surprised by some of the prices (the unsalted butter is 56p more expensive than Waitrose round the corner and the Greek yogurt is 22p more than that supposedly dearer emporium), disappointed that in the height of new potato season the only ones on sale were pre-prepared in a buttery sauce and a little shocked that a sirloin steak needs to be security protected. The meat, in fact, was the least inspiring I’d seen for a long while (although wait until I tell you about Sainsbury’s) so, if I was forced to cook from a shop like this on a regular basis I would focus on three things: eggs, cheese and veg, with some gnocchi and ready-rolled pastry thrown in. That might not sound like much but onions and cheese make some glorious, simple dishes, especially if you have access to herbs (I used thyme from my window ledge in this) and some other basic condiments. This tart for example, might take you a little longer than a ready meal (though, at 50 minutes in total, not much) but it will cost you less and leave you feeling so satisfied at having avoided those little cardboard- and plastic-wrapped curries. 2. Flour a baking sheet and roll out 200g of pastry onto it (about half a 375g packet). Score a line about 1-2cm in from the edge. 3. Peel, top and tail the onions and cut them into largish pieces rather than rings. 4. Soften the butter over a medium heat in a large frying pan or saucepan, then add the onion pieces. Cook slowly, stirring to make sure the onions are equally coated in butter, for about 30-40 minutes, until the onions are golden, sticky and soft. 5. 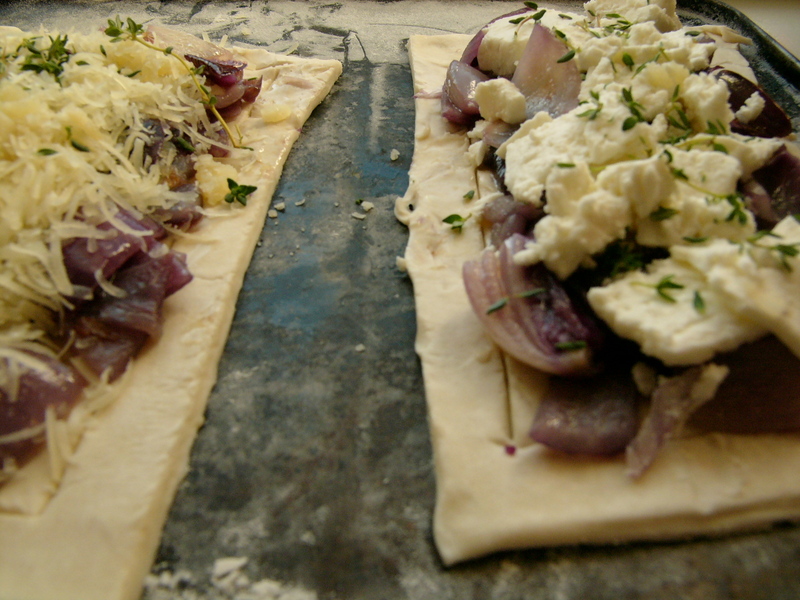 Whilst the onions are cooking, cut up the cheese (if using feta) or grate it (if using Parmesan). 6. When the onions are done, put them on the centre of the pastry rectangle (inside the scored line), top with the cheese (and thyme if available) and bake for about 12-15 minutes. Delish on its own, with salad or taken in a sandwich box for lunch. ...to this in about 15 minutes. This entry was posted in Cookery writers, Fast food fixes, Nigel Slater, One pot, Random bits that don't belong in a category..., Spring vegetable recipes, Summer recipes, Vegetarian recipes and tagged cheese recipes, easy recipes, Nigel Slater, Onion tart recipe, tart recipes, Tesco's. Bookmark the permalink.